Sure, folks get excited about riding Space Mountain, seeing fireworks, catching a parade or two, and experiencing many of the other high points of a Disney World visit. But there may be no higher point, particularly for children, than meeting Mickey Mouse and his pals. And there may be no better way to get some face time with the gang than at a character meal. So, how do you plan Disney World character dining for your gang? First, you need to know which restaurants offer the option. They can be found at all of the theme parks and a few select hotels. Let's rundown which eateries feature characters and at what meals. Once you determine which restaurant(s) you want to visit, you'll need to make reservations. I can't emphasize this enough. Reservations are recommended for all Disney World restaurants that accept them, but the character meals are especially popular, and availability can be difficult. I've got a page that offers info about making advance Disney World dining reservations. None of the eateries with characters made the list of Disney World's best restaurants. That doesn't mean that they aren't good, just that they aren't among the finest of the resort's many places to dine. 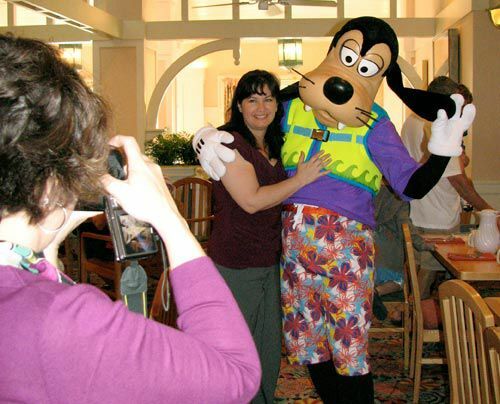 Really, the food is somewhat beside the point; it's more of an excuse to take a photo with Donald Duck, get a hug from Minnie Mouse, or goof around with Goofy. With the exception of Cinderella's Royal Table, all of the meals are either buffets or served family style (or a combination of both). That's probably by design since things can get complicated when waitstaff taking individual orders and delivering food interrupt the flow of visits from the characters (or vice-versa). Buffets are great for fidgety kids who can hardly wait to meet Mickey, let alone wait for their meals. Also, guests can time their visits to the buffet stations so that they don't miss the main event. There are plenty of culinary options geared to kids at the participating restaurants. For the most part, the food is fairly generic. A few of the more interesting standouts include lunch at Tusker House, which offers some exotic African-inspired dishes, dinner at Garden Grove, which features barbecue and Mediterranean fare on select evenings, and lunch or dinner at Akershus Royal Banquet Hall, which offers some Norwegian cuisine. It probably goes without saying, but for crying out loud, don't forget to bring your camera to capture some keepsake moments. If your kids (or you?) are into it, make sure they bring their autograph books as well. Let the characters come to you. They do a great job of making sure they spend some quality time with every table of guests, but they aren't too keen about unsupervised kids who run after them as they make their rounds. Be patient. They will visit you and your kids. Some of the meals include group activities, such as dancing conga-line style around the dining room with the characters. This can make for a noisy dining experience. Not all restaurants offer characters at every meal. Also, some of the seatings are available certain days of the week and/or times of the year. Make sure to check Disney World's official dining info for the most up-to-date schedules. Consider booking an early or late meal. Since they tend to be less crowded, you could get more attention from the characters. Sometimes, Disney has a limited-time offer that includes free meals with park tickets and hotel packages. The restaurants offered typically include those that offer characters. Characters might include: Mary Poppins, Alice in Wonderland, Winnie the Pooh, and others. Characters might include: Cinderella, Belle, Snow White, and others. Characters might include: Minnie Mouse, Goofy, Donald Duck, and others. Characters might include: Mickey Mouse, Pluto, Donald Duck, and others. Characters might include: Cinderella, Princess Aurora, Snow White, and others. Characters might include: Winnie the Pooh, Eeyore, Tigger, and others. Characters might include: Lilo, Stitch, and others. Characters might include: Donald Duck, Mickey Mouse, and others. Characters might include: Cinderella, Belle, Ariel, and others. Characters might include: Mickey Mouse, Pluto, Minnie Mouse, and others. Characters might include: Cinderella, Jasmine, Snow White, and others. Characters might include: Winnie the Pooh, Piglet, Tigger, and others. Characters might include: Donald Duck, Goofy, and others. Have dinner with Disney characters at the following restaurants. You should make reservations for these highly popular character dinners. Find info about making advance Disney World dining reservations. Keep in mind that some of the dinner meals may be offered certain times of the year and/or days of the week. Go to Disney World's official dining info for the most current schedules. Characters might include: Cinderella, Prince Charming, Anastasia, and others. Characters might include: Snow White, Belle, Ariel, and others. Characters might include: Mickey Mouse, Goofy, Minnie Mouse, and others. Characters might include: Cinderella, Ariel, Snow White, and others. Characters might include: Tigger, Winnie the Pooh, Piglet, and others. In addition to meals, the Disney characters are incorporated into some special events at the following restaurants. Reservations for these highly popular character events are critical. See my page with info about making advance Disney World dining reservations. Keep in mind that some of the events may be offered at certain times of the year and/or days of the week. Go to Disney World's official dining page for the most up-to-date schedules. Characters might include: Alice in Wonderland, The Mad Hatter, and others. Campsites: Mickey's Backyard BBQ buffet. Includes a show. Only offered certain times of the year. Characters might include: Mickey Mouse, Goofy, and others. Garden View Tea Room: Disney's Perfectly Princess Tea. Includes apple juice "tea," sandwiches, fruit, and cake.